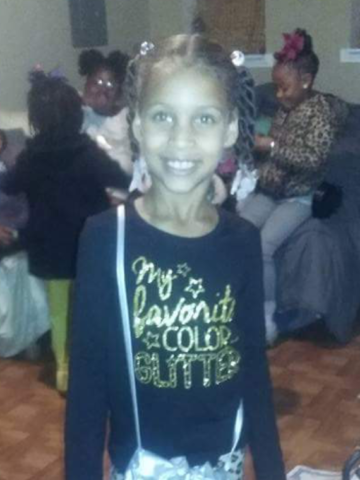 Briana Chi’Anne “Bri” Lewis, age 7 of Springfield, went to be with the Lord hand in hand with her siblings on December 12, 2016. Briana is preceded in death by her grandmother, Patty Cunningham and great-grandparents, Barbara and Joe Robinson. Left to cherish her memory are her parents, Brittany Crayton and Julian Pope; her siblings, Brantavius “Tyree” Lewis, Keaja Pope and Byron Crayton; grandmother, Candace Murphy (Fernando); grandfather, Mark Crayton; uncles, Patrick Cunningham, Mason Rupe and Jonathan Rupe; aunts, Molly Pope and Tesha Suggs, cousin and best friends, Braniiya Carr; all the Pope family; Murphy family, Robinson Family and a host of aunts, uncles, cousins and friends. A Life Celebration Service will be held on Saturday, December 17th at 2:00 P.M. at Springfield Baptist Church, interment will follow in Springfield Memorial Gardens. The family will receive friends at the church from 11:00 A.M. until service time. Enjoy your wings Angel! God loves you best! I am so sorry to read of the loss of your precious babies. I hope you can find some comfort in the words of Jesus recorded at John 11:11-14. In those verses, Jesus likens death to being asleep. At John 5:28,29 he makes the promise that “All those in the memorial tombs will hear his voice and come out.” This means that you have the hope of holding your babies again. For more on this topic, type the following URLs into your browser to read or listen to the Bible’s answer to the question “Can the Dead Really Live Again?”: tinyurl.com/mezwv23 and tinyurl.com/jyp4yl4. Please accept my deepest sympathy and sincerest condolences.